He loves to rest his head on your shoulder and gaze at you with his beautiful, intelligent eyes — one brown, one blue — both equally tranquil in his closeness to you, quietly illustrating all the integrity American Pit Bull Terriers are prized for. At 3 years old, 45 lb. 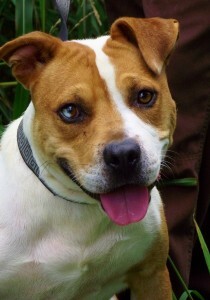 Leroy’s full grown and delightfully handsome, his smile never fades, and he’s destined to be a superlative family dog. Leroy’s so well-mannered he even plays politely, and so cooperative he’ll kennel himself on request. His eager-to-learn attitude’s all about pleasing you; he already conscientiously potties outside his box and is well on his way to house-trained. See how calmly Leroy will hang in your arms, relaxing in your embrace because that’s where he belongs, and what a perfect match he can be for you and yours. Her meow’s so melodic you’d think she was the Little Mermaid herself, but 18 month old “Ariel” has a pristine, pure-white coat that’s softer than any Disney character ever could be — and her purr’s as harmonious as her gentle personality. 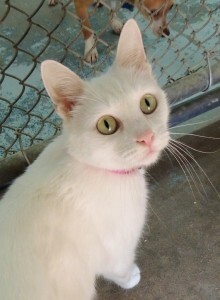 Ariel was found stray, an exquisitely mannered young lady cat who lives to be held; her pink ears are so fragile she’ll need to stay indoors with you to avoid sunburn, but one sing-song greeting from this captivating companion and you wouldn’t have it any other way. Ariel’s refined ways make her a lovely choice for kids — she’ll sparkle patiently in their arms. Go to PetSmart today and hear Ariel’s glorious friendship-song for yourself, then take her home to hear it forever.